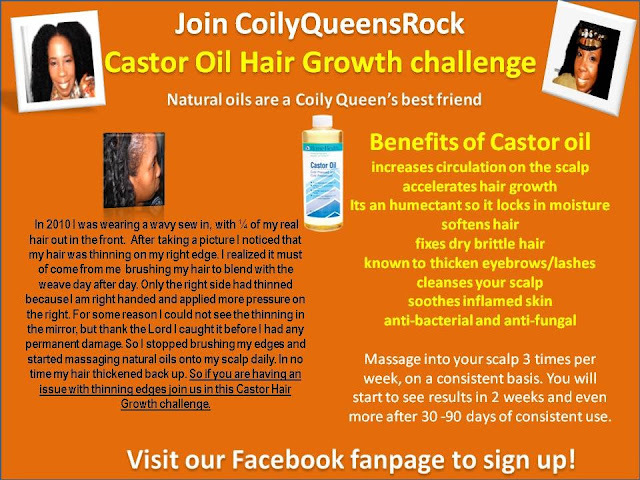 Join us for a 30 day Castor Oil for hair growth challenge! By now you have heard and read many testimonies about the benefits of using castor oil on your hair. If you search youtube you will find dozens of women on video testifying of the great benefits of castor oil. Many women say that castor oil thickened their hair and some testify that castor oil grew back their thinning edges. Why not find out for yourself whether Castor Oil can benefit your hair or not. Purchase the Castor Oil of your choice, take before pictures and document your hair growth every 30 days. You must commit to massaging the oil onto your scalp 3 times or more per week. You are also encouraged to eat well, exercise, drink lots of water and maintain a good hair care regimen of cleansing and conditioning. Sign up for the challenge on our Facebook fanpage! Let's see what Castor Oil can do!